Several listed Chinese electric vehicle (EV) companies and associated component makers issued profit warnings in recent days, as many companies suffered from inflated valuations at acquisition. At the same time, China's EV industry is going through a transition period, experiencing growing pains as subsidy-oriented EV products and business models are weeded out. "China's EV industry development centers on government subsidies at present," John Zeng, a Shanghai-based analyst at LMC Automotive, told the Global Times in January. He said once the subsidies are removed, companies will truly take part in market-oriented competition, and those still living on subsidies would be knocked out. In 2009, China's EV output was under 300; the number of vehicles soared to 1.27 million 10 years later, according to Caixin Magazine. Over the past decade, the government has provided substantial subsidies in order to encourage social capital to invest in the fledgling EV industry. As a result, China has now become the world's largest EV market, each year since 2015. China's EV industry has moved from the start-up stage to the growing phase, and market competition has become the key driver, commented by Miao Wei, head of the Ministry of Industry and Information Technology (MIIT) in January, according to Caixin Magazine. In order to control subsidy swindles, authorities carried out inspections of the EV industry in 2016 and changed the subsidy policy later, no longer providing benefits to all the producers. Meanwhile, the regulator has decided to cut subsidies to the EV industry completely by 2020. With the state support and profitable prospects, many listed companies targeted the EV sector as their main business line, hence purchased EV-related companies. However, according to several 2018 profit warnings, released by some listed companies, their EV business suffered from poor financial performance last year. As of the end of January, A-share listed companies released their profit warnings, and most were caused by goodwill impairment. Goodwill impairment is a charge that companies record when goodwill's carrying value on financial statements exceeds its fair value. Goodwill impairment arises when there is deterioration in the capabilities of acquired assets to generate cash flows, and the fair value of the goodwill dips below its book value, according to Investopedia. Caixin Magazine said 190 companies made goodwill impairment part of the reason for their unsatisfactory performance out of the 669 listed companies that issued profit warnings, accounting for approximately one-third of the total. The China Securities Regulatory Commission issued a document to warn of the risks of goodwill impairment in November of 2018, urging companies to test its goodwill by the end of 2018, as long as there were merger discussions taking place among companies. Caixin Magazine said over-priced merger valuations will lead to risks of goodwill impairment. Take South China's Guangdong-based Dongfang Precision as an example. The company bought the Beijing-based new-energy vehicle battery provider, Pride Power, in 2017 for 4.75 billion yuan. On January 30, Dongfang Precision announced Pride Power's decline in performance last year, adding the latter had a serious goodwill impairment. As a result, Dongfang Precision had to prepare 3.06 billion to 4.14 billion yuan to cover the bigger goodwill impairment, and so predicted a 2.94 to 4.41billion yuan loss. A financial expert told the Global Times on Monday the results indicate there was not sufficient due diligence performed on some target EV companies by the acquirers, which hinted a basic failure of management by the acquirers. In addition, listed companies carry out improper earnings management. On January 30, Guangdong-based Broad Ocean predicted the company's losses at 2.1 billion to 2.3 billion yuan, and prepared to write-off 2 billion to 2.15 billion yuan for Shanghai Edrive which was bought by Broad Ocean in 2016 at 3.5 billion yuan. Although Shanghai Edrive promised the buyer that its net-profits could reach 277 million yuan in 2018, it has failed to meet the promised revenues since 2016. In 2016 and 2017, Broad Ocean had written off 27.3 million and 80.75 million yuan as the preparation for the goodwill impairment. On January 30, Shenzhen Stock Exchange required Broad Ocean to explain the large amount of money write-off for the goodwill impairment and questioned the company's behavior of improper earnings management. As of February 4, Broad Ocean did not respond to Caixin Magazine's inquiry. Goodwill impairment could sugar up the company's annual reports, making the EV companies "appear to make money," experts told Caixin Magazine. Midstream enterprises in the EV industry suffered the most from the goodwill impairment, including, companies manufacturing EV batteries, electric motors, electronic control systems and lithium battery materials. According to a filing to the Shenzhen Stock Exchange, Chinese electric automaker BYD said that after the national subsidy standard was changed, the subsidy per car reduced by 30 percent. The company added that due to the longer period of subsidy distribution, its sales team adopted a "loose" policy which resulted in a booming number of receivables, since 2016. As of June 30, 2018, the balance of accounts receivable reached 57.4 billion yuan at BYD, accounting for about 30 percent of its total assets. The large amount of receivables caused a great burden on the cash flows of BYD, continually increasing its financial expense. 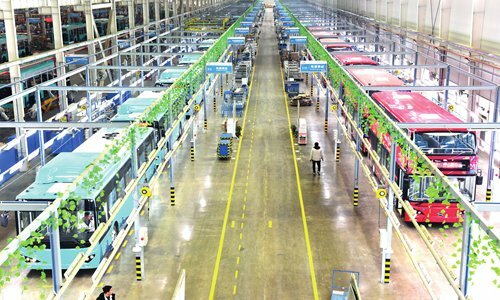 BYD said in the first half year of 2018, the company's financial expense rose by 40 percent due to the increase of its interest-bearing balance, totaling 14 billion yuan. Another domestic EV leader, BAIC BluePark New Energy Technology, also suffered from a similar problem regarding cash flows as BYD. Xu Heyi, chairman of the Board of its parent firm, BAIC Motor Corp, once complained that as more new-energy vehicles were sold, the more financial burdens the company bore, because the money was all allocated to supplement the cash flows of BAIC BluePark New Energy Technology. The cash flow pressure has been passed down to the midstream enterprises, making those company's financial burden increase. Lithium battery dark horse, Shenzhen-based OptimumNano Energy, is a typical example which has hindered both its parent's and suppliers' development. Its parent firm, Shaanxi J&R Optimum Energy, announced on February 1, the company predicted a loss of 5 to 5.44 billion yuan in 2018. This article is based on a report of Caixin Magazine on February 4.